A train arriving at the upper platform level of Secaucus Junction station. Secaucus Junction (formerly known as Secaucus Transfer during planning stages; also signed simply as Secaucus) is a major commuter rail hub in Secaucus, New Jersey. It serves trains from all New Jersey Transit Rail lines except the Princeton Branch and Atlantic City Line, and also serves the Metro-North Railroad Port Jervis Line and Pascack Valley Line. 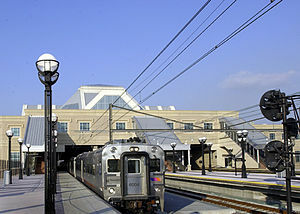 It was dedicated as the Frank R. Lautenberg Rail Station at Secaucus Junction and opened on December 15, 2003. U.S. Senator Frank Lautenberg, who died in 2013, was a transit advocate who had worked to allocate federal funds for the project. The $450 million, 321,000-square-foot (29,800 m2) station sits where the Main Line tracks pass under the Northeast Corridor allowing passengers to transfer between trains to and from Hoboken Terminal and trains to and from New York Penn Station. In March 2016, a new bus station with 14 bus berths opened at the terminal. It is used primarily for transferring passengers but was also conceived to add redundancy to the transportation network. The station does not currently serve Amtrak trains running along the Northeast Corridor, which pass through the station on the upper level without stopping. However, Amtrak is considering servicing Secaucus after the nearby American Dream Meadowlands mall opens in 2019. Unlike other New Jersey Transit rail stations, Secaucus Junction was specifically built as a transfer point; it allows passengers to transfer between trains on nine of the agency's commuter rail lines. Before Secaucus Junction was built, commuters on non-electrified lines to Hoboken Terminal used PATH trains or ferries to reach Manhattan and other points in New York City. Commuters whose trains terminated at New York Penn Station could connect to subway services, but except for Morristown Line riders, all commuters on lines entering New York Penn Station had to go to a PATH station to reach Hoboken. The two-track Northeast Corridor mainline embankment was expanded to three tracks for a mile on each side of the station and to four tracks through the station itself, allowing Amtrak and nonstop NJT trains to pass stopped trains. The two-track Bergen County Line was re-aligned southwestward to join the two-track Main Line to pass through the station on the four-track lower level. The construction required the bodies from the Hudson County Burial Grounds to be disinterred and moved to another cemetery. The station was built with little public parking, as NJT believed few passenger trips would originate at the transfer point. In 2005, Exit 15X on the adjacent New Jersey Turnpike opened to provide easier access to the station from the surrounding area. Two years later, 15X was the least-used interchange on the turnpike, due in part to the lack of parking at the station. On June 1, 2009, Edison Parkfast, a private company, opened the first parking lot near the station, with space for 1,094 cars. Bicycle parking is also available. On July 26, 2009, NJ Transit began frequent shuttle service to the Meadowlands station at the Meadowlands Sports Complex, with the Secaucus station being a transfer point for passengers from New York City and other areas in New Jersey. Also since 2009, Secaucus Junction serves trains coming from Metro-North's New Haven Line for connecting trains to football games at the Meadowlands. The service runs one train in each direction for New York Giants and New York Jets games with 1:00 p.m. kickoffs on Sundays. On February 2, 2014, a limited number of Amtrak trains made stops at Secaucus for passengers going to Super Bowl XLVIII. Local officials have indicated a desire to have regular Amtrak service stop at Secaucus Junction after American Dream Meadowlands opens in March 2019. Despite its name, Secaucus Junction is not a true junction, in which trains can be switched between lines; there is no rail connection between the upper and lower levels. The station has two platform levels connected by a third level on top. Such a loop, however, is proposed as part of the Gateway Project to improve commuter access to Manhattan. The bottom level lacks electrification and has four tracks and two island platforms serving the Bergen County Line, Main Line, Pascack Valley Line, Port Jervis Line, and Meadowlands Line trains, which originate and terminate at Hoboken Terminal. The upper level of tracks is electrified and serves trains to and from New York Penn Station (usually the Northeast Corridor (NEC), North Jersey Coast, Montclair-Boonton, and Morristown Lines) with four tracks and three platforms: two side platforms serving Tracks 2 and 3 (where nonstop trains usually bypass) and one island platform serving Tracks A and B. The upper concourse of the station contains amenities and serves passengers switching trains. To transfer between trains on different levels, passengers climb up to the concourse, pass through faregates (which only accept a ticket once), and descend back down to their destination platforms. At the center of this level is a 30-foot-high (9.1 m) steel, glass, and titanium sculpture of a cattail (abundant in the surrounding New Jersey Meadowlands) by San Francisco artist Louis "Cork" Marcheschi. The tops of the cattails are lit from within in the purple, blue, and orange colors of NJ Transit. On November 16, 2010, The New York Times reported that Mayor Michael Bloomberg's administration was working on a plan to bring the 7 and <7>​ trains of the New York City Subway under the Hudson River to Secaucus Junction. An extension of that service, from its then-terminus at Times Square – 42nd Street to a new terminus at Eleventh Avenue and 34th Street, has already been constructed. If built, the extension would take the New York City Subway outside the city's and the state' borders and under the Hudson River for the first time. The plan would alleviate pressure on the NJ Transit/Amtrak route under the Hudson River, after the cancellation of the Access to the Region's Core tunnel project by New Jersey Governor Chris Christie in October 2010. It would offer a direct route to Grand Central Terminal on the east side of Manhattan, while connecting with most other subway routes. New York City spent $250,000 for a consultant to conduct feasibility studies for the project. However, no design work commenced nor were financing arrangements made. On October 26, 2011, New York City Mayor Bloomberg reiterated his support for the project, while New Jersey Governor Chris Christie also expressed general concurrence. In April 2013, the Metropolitan Transportation Authority rejected the proposed extension, citing lack of funding. It was reconsidered again in 2018. The Gateway Project, a series of infrastructure improvements along the NEC between Newark Penn Station and New York Penn Station, includes a proposal to build the so-called Secaucus Loop or Bergen Loop, by constructing additional trackage between the two levels of Secaucus Junction that would connect the Main Line and the NEC, thus creating a true junction station. As part of the second phase of the Gateway Project, the loop is projected to be constructed between 2024 and 2030. ^ "QUARTERLY RIDERSHIP TRENDS ANALYSIS" (PDF). New Jersey Transit. Archived from the original (PDF) on December 27, 2012. Retrieved January 4, 2013. ^ "How Many Riders Use NJ Transit's Hoboken Train Station?". Hoboken Patch. Retrieved July 18, 2018. ^ Frassinelli, Mike (June 5, 2013). "U.S. Sen. Frank Lautenberg gets one last ride at the Secaucus station that bears his name". The Star-Ledger. Retrieved June 5, 2013. ^ Higgs, Larry (March 29, 2016). "How new Secaucus bus plaza could change your commute". NJ.com. Retrieved March 29, 2016. ^ "Ramp to nowhere - 15X is the loneliest exit in Jersey". The Record. October 18, 2007. p. L08. ^ "First parking lot opens at Secaucus Junction". The Jersey Journal. June 2, 2009. Retrieved August 15, 2009. ^ "New Jersey Transit". njtransit.com. ^ Clunn, Nick (July 26, 2009). "Thousands hop on board new Meadowlands rail service". The Record. Retrieved August 15, 2009. ^ Saeed, Khurram (June 29, 2009). "Metro-North to run trains to 10 Jets, Giants games in the 2009 season". Journal News. p. A.1. ^ "Take The Train To The Game" (PDF). Metropolitan Transportation Authority. Retrieved December 24, 2012. ^ Rouse, Karen (December 9, 2013). "NY-NJ transit agencies outline Super Bowl plans". NorthJersey.com. Retrieved December 27, 2013. ^ Higgs, Larry (December 8, 2018). "Next stop for Amtrak: Secaucus? That could be an American Dream for the Meadowlands". NJ Advance Media. Retrieved December 10, 2018. ^ a b c d "New Jersey Transit". njtransit.com. ^ "NJ Commuters Like 7 Train Extension Plan". WCBS. November 17, 2010. Retrieved November 17, 2010. ^ "Tunnel to Nowhere Might Become 7 to Secaucus". WNBC. November 17, 2010. Retrieved November 17, 2010. ^ Bagli, Charles (November 16, 2010). "New York Studies Extending Subway Line to New Jersey". The New York Times. Retrieved November 16, 2010. ^ "Mayor Bloomberg wants to extend 7 line to New Jersey". ABC7 New York. ^ "Mayor Bloomberg push to extend 7 train to Jersey is promptly derailed by the MTA". Daily News. New York. April 10, 2013. ^ "Port Authority study will consider 7 train extension to New Jersey". Curbed NY. Retrieved April 16, 2018. ^ "Cross-Hudson study options include 7 line extension into NJ". am New York. Retrieved April 16, 2018. ^ "Gateway Project Timeline Released, But Cross-Hudson Capacity Relief Still a Long Way Off". Retrieved March 30, 2016. Wikimedia Commons has media related to Secaucus Junction. This page was last edited on 31 March 2019, at 21:41 (UTC).